Thanks for your reception report, the details you mention are correct. The Twente websdr receiver is fairly close to me so reception is usually not good (in between ground wave and skywave). I was using a small transmitter I have build myself , it was producing 14-18 W carrier power with a pep of 50W. It was a test transmission because the band seemed open at the time and for local (short skip) it was for a while, long skip however was not that good. I usually monitor my signal on the web sdr in stafford UK and on the Polish web sdr both did not get my signal. so it was odd conditions. I do not have any promotional material like stickers or a web site. I am not a broadcaster but a radio hobbyist, receiving is just as much fun. Thanks again for your mail. 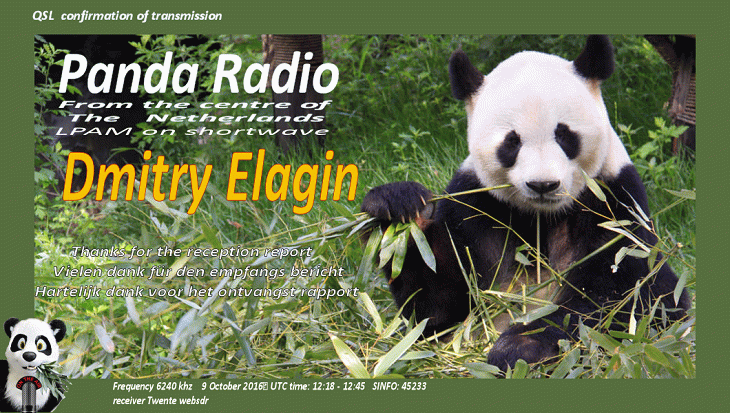 I made you a personalised e-qsl card. Станция принята через удаленный приемник в Нидерландах.